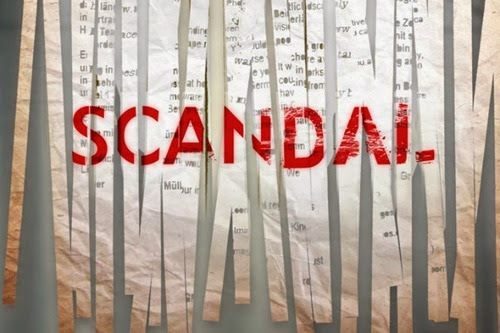 Scandal Sunday 4.11–Where’s The Black Lady? So, the Vice-President takes control of the entire White House in order to undermine the President and eventually take over that role himself. No, this is not House of Cards, where that scenario actually happened politically and believably, this is Scandal. And therefore we have no understanding of how exactly the VP was able to turn the Secret Service, the secretaries, the drivers, and whoever else against Fitz. And while he was doing all that, he didn’t bother to tell either one of his lovers his plan. Wouldn’t he have wanted Mellie on his side? I guess I’m a little confused. The episode began with Fitz asking his secretary to get him Jake, the CIA, and the FBI, obviously ready to start the search for Olivia, who he just found out was kidnapped. However, the Secret Service comes in and informs him that he cannot search for her because they are watching him. Fitz still manages to communicate with Jake, who he meets in Olivia’s apartment and who he gives the proof of life video that Olivia made. Jake takes the info to Huck and Quinn, who are able to spot Olivia’s kidnapper in the reflection of the glass she is drinking water from. Nice move Olivia! However, facial recognition finds nothing on the kidnapper. An older lady shows up at Olivia Pope and Associates looking for “the black lady,” hence the title of the episode. She won’t talk to Quinn at first, because Quinn is not the black lady. Eventually, the information is revealed that this lady is a friend of Lois, Olivia’s neighbor, who is also missing. This sends the team to Lois’s apartment, where they find the ring that Olivia dropped, revealing that she was there. They then use the internet connection to figure out who last used the internet there, and this leads them to Otto, the kidnapper that Olivia killed in last week’s episode. Still no luck on a location for Olivia though. Meanwhile, Fitz somehow decides to trust Mellie (and not Abby, who still has no idea Olivia is missing, though Fitz does inform Cyrus), who tells him that if he loves Olivia, which of course he does, he should declare the war that will supposedly save Olivia’s life. Starting the war only serves to prove to everyone just what Fitz will do for Olivia, and her kidnapper reveals that he’s going to keep her until Fitz is done being President. After Mellie finds out that Huck has ripped up Lizzie’s back for information that she doesn’t have, she seduces Andrew and steals his phones, which she passes to Lizzie. Lizzie delivers the phones to OPA and they are finally able to determine that Olivia is in PA. With the help of David Rosen, they raid the building, only to find that she is already gone. Because Olivia Pope saves herself. She manages to convince Ian that she is worth far more than he is making holding her hostage and that he should sell her to the highest bidder. So, after allowing Olivia and Fitz to say “hi” to each other on the phone, Ian explains to him that she is going to be auctioned off. Olivia feels like this plan is going to set her free, or maybe that someone she loves will be the highest bidder, and this will be the focus of next week’s episode. Got all of that? Okay, now I’m going to show my fan girl side! You know how Olivia dropped her ring for her team to find? And in this episode, Huck found it and Jake asked him if he’s sure the ring belongs to Olivia? Huck’s answer is “She wears it for him. She never takes it off.” Him is Fitz, by the way, and Jake spent two months alone on an island with Olivia and doesn’t know she never takes off that ring?! Well, the ring has been a thing throughout the seasons of Scandal, with both Kerry Washington and Lyn Paolo, the costume designer, claiming that there is a back story to the ring, which Olivia always wears – only she doesn’t wear it in flashbacks, meaning she didn’t have the ring until after she left the White House the first time. Shonda Rhimes spoke out on Twitter and said that the ring has NO story and NO meaning, but Kerry and Lyn still felt that it did have a story. So now, with her dropping it and Huck saying she wears it for Fitz, there is a story. Okay, ready? That’s me on the top there. 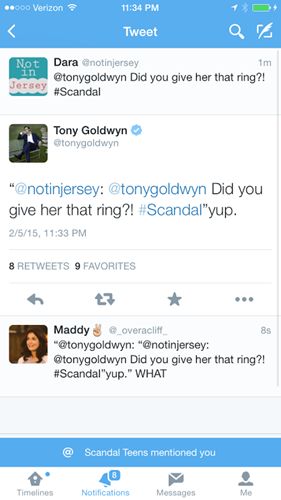 And that’s Tony Goldwyn responding to me, that YUP he gave her that ring! See that blue line at the bottom? That’s someone replying to the tweet – my twitter blew up after that! But imagine me seeing “Tony Goldwyn mentioned you”?! It was crazy. Kerry Washington replied too! Agreeing that he did indeed give her that ring! Amazing!! 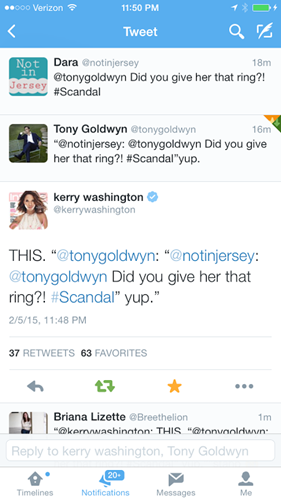 Even if Shonda feels there is no background story for the ring, Kerry and Tony agree that there actually is one. And my year has been made.